We’ve been thinking of buying a second car for a while now. As we now have two good wages coming in it seems right that we should buy another car so that the kids and I can get out to during the day. 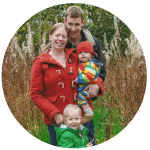 There are so many home education meetings throughout our area that aren’t always accessible by public transport, so a second car would be particularly useful to us. So when we were recently asked by John Clark Motor Group to review one of their cars I was excited to find out which car it would be! 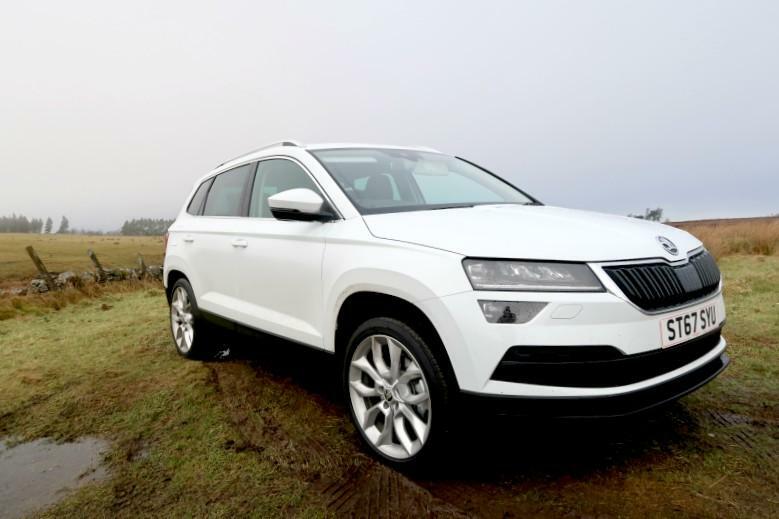 Excitingly we were offered the chance to review the new SKODA Yeti Replacement, the Karoq. We have previously owned a SKODA Fabia Estate, which we loved and it was a perfect family car for us at the time. So we are definitely no strangers to SKODA cars and were looking forward to trying it out! 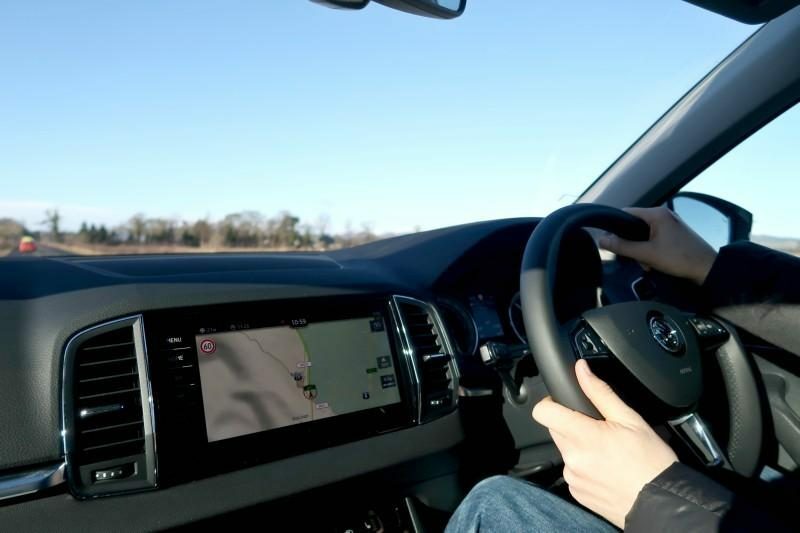 We picked the car up from SKODA Thomson & Potter in Perth and were shown all the main features. The kids favourite was the impressive lights that from the base of the car door that shone the word ‘SKODA’ onto the ground. Not an essential detail for driving, but certainly a little bit of a WOW factor when you first open the car door! After the run through of the features we immediately put to use the inbuilt Sat Nav device to drive back through the maze of city streets to find the A9! We don’t know Perth very well so we definitely needed a little help driving back home. The Sat Nav is fairly straightforward and after a few attempts we perfected it’s use. 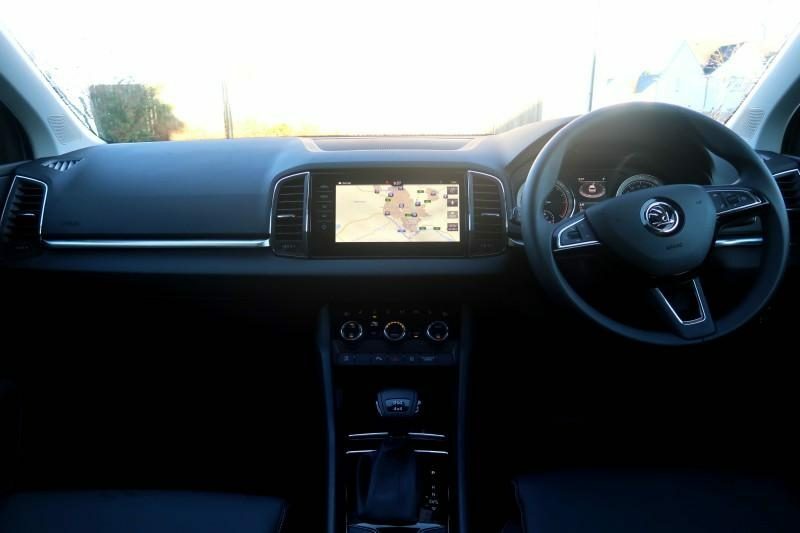 The dashboard is fairly self explanatory with the addition of a digital screen that assists the main Sat Nav screen by showing which direction to go with a helpful arrow and distance until the next turn. The only thing I disliked about the dashboard is that the speedometer increases in twenties and so it doesn’t show 30 or 70 mph by number. Instead you need to look at the halfway line between the numbers to work out whether you are over the speed limit or not. Not a big issue, but it is probably because I’m so used to a digital screen telling me my speed in large easily read numbers (maybe I’m getting lazy?!). I like the little details like electronic buttons to shift the driver seat position and simple handle to shift the steering wheel into a comfortable position. 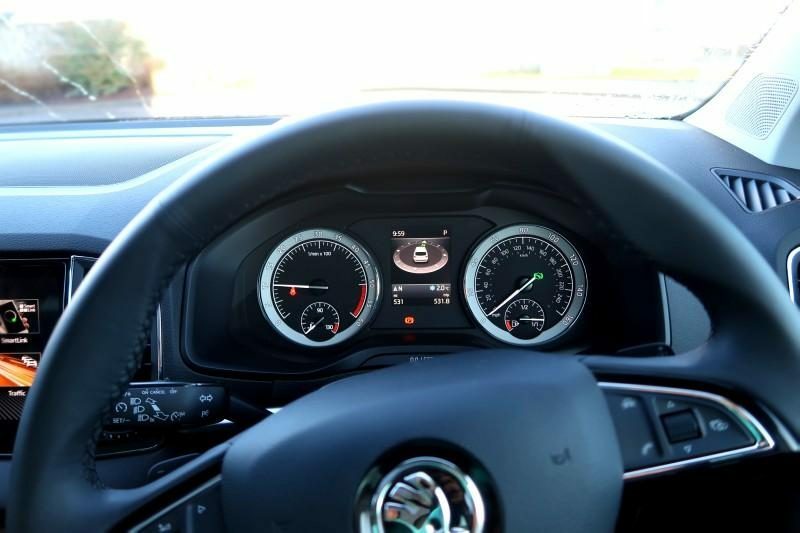 As it’s winter we also made full use of the heated seats, and even better, a heated steering wheel. My freezing fingers definitely appreciated that! 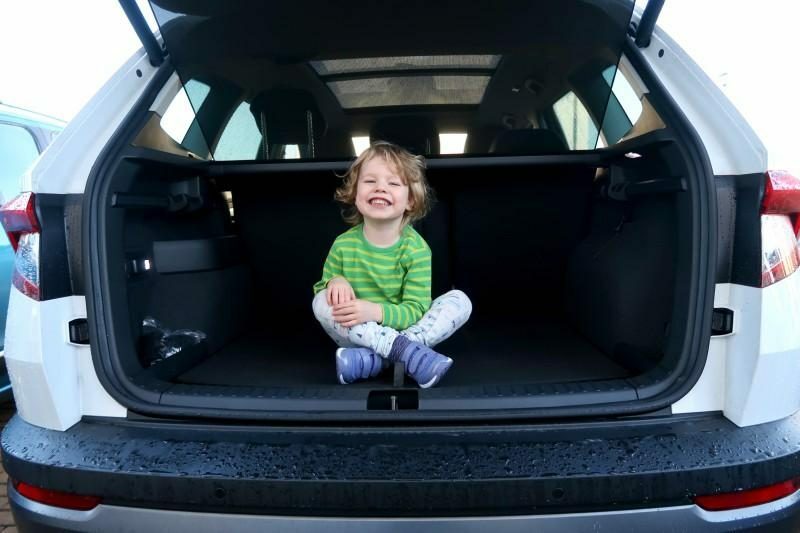 The Karoq is a great SKODA SUV and the boot size is perfectly adequate for a family of four and easily fits a four year old, with plenty of room for luggage! In all seriousness the boot is huge and we could easily fit our usual holiday luggage of 2 large suitcases and 2 small cases. The base of the boot can be lifted out to increase the depth and a spare tyre is found under the second base of the boot. It seems that a lot of car brands now save money and space by putting in tyre sealant instead, which is not so easy to use. So we were rather pleased to know it has a spare tyre. Inside the back of the car it appears quite spacious. Enough room for the children to sit and tables for them to put their books, paper and pencils or snacks (not that we would dare let them eat in this beautifully new car!). The tables also have the addition of a little cup holder that pops out the side. 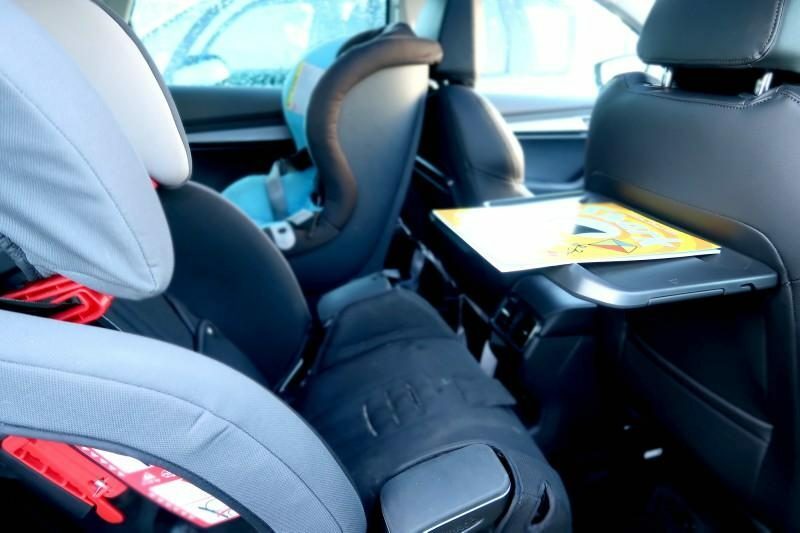 The car seats can easily be folded down to create more room in the boot and we had no problems fitting in both a forward and an extended rear facing car seat. 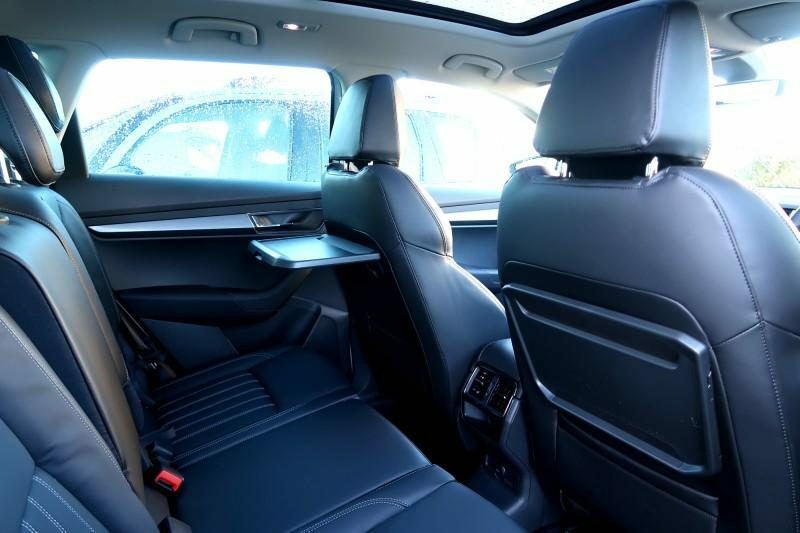 There are Isofix systems available in the back two window seats, although we use a seat belt attachment for our car seats. 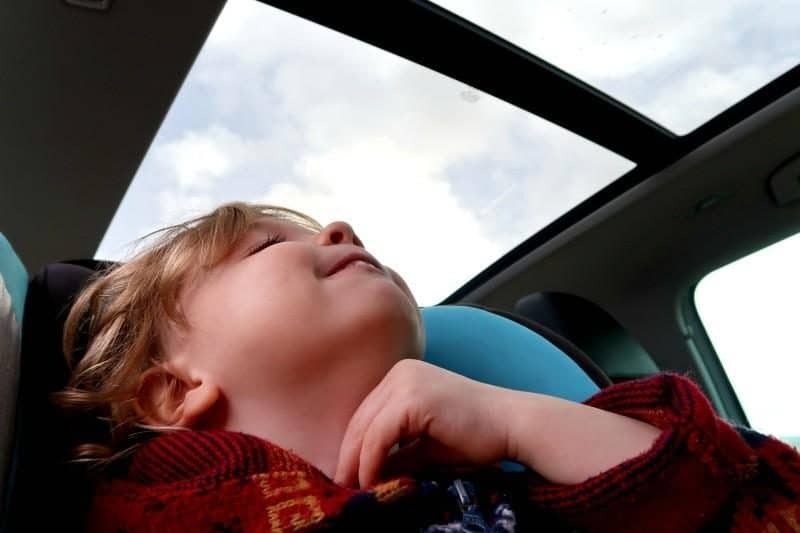 The sun roof is great to entertain the children looking up at the clouds and trees, but I can imagine it being particularly nice in the summer months. There is a simple button to press to open the sun roof and another to place the cover over the sun roof to hide it. Other exciting buttons include the ability to open and shut the boot with the button on your key. Just make sure the children are out the way when you start shutting the boot! Although the boot apparently stops if it senses anything in the way, clearly we didn’t test this with the kids! We had the SKODA Karoq for 3 days and although we weren’t away for the weekend, we did manage to fit a lot in! 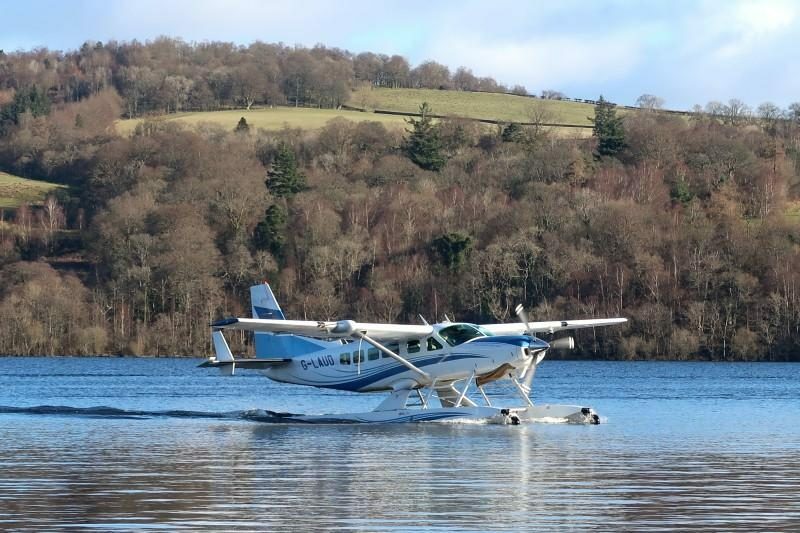 On the Friday we went for a VERY exciting trip, a drive across to Balloch for a flight on Loch Lomond seaplane. The children stayed with their grandparents at Loch Lomond shores, playing pirates and searching for fish at the sea life centre. 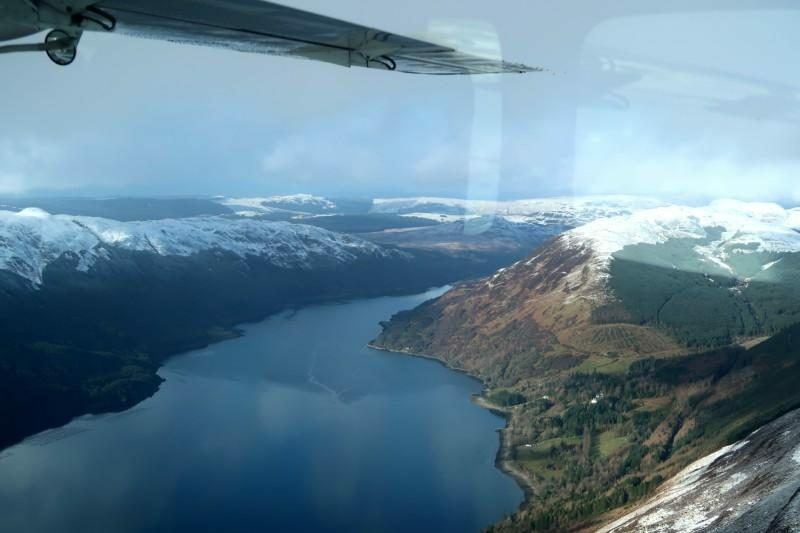 Chris and I climbed aboard the seaplane and a few minutes later we were soaring across Loch Lomond and heading west toward the coast. It was only a 45 minute trip, but we flew all the way out across to Arran, Gigha and looking out a the snow showers across on Islay before heading back the way we came to land on Loch Lomond. The views were incredible and well worth the trip! I was surprised what a smooth ride the car was considering the state of the roads from Drymen to Balloch. 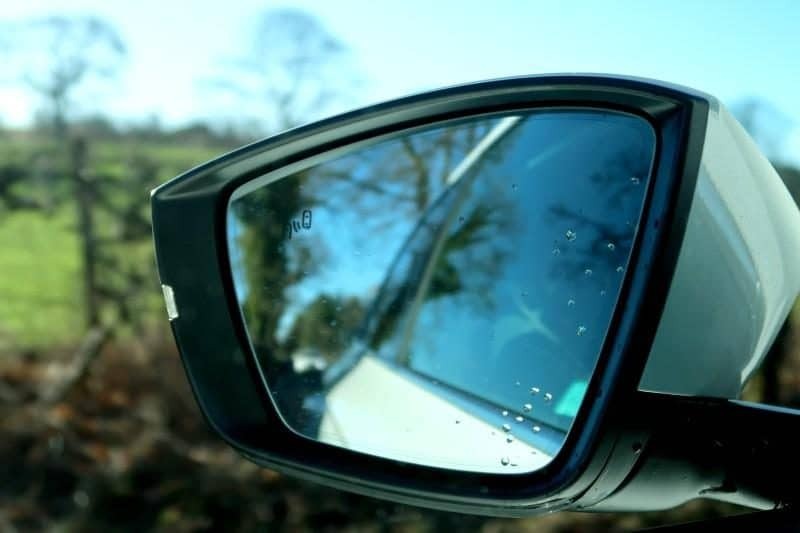 Clearly the winter weather has taken it’s toll, but it wasn’t a problem for our SKODA! On Saturday we had a little trip into the hills, it was a cloudy start but we eventually had some blue skies! We parked the car off-road to take a few photos and go for a little walk. Despite the ground being fairly wet it was still easy to get the car off the grass and back on the road. We drove down from the hills for a more civilised afternoon adventure, a visit to the theatre for a Red Riding Hood musical. 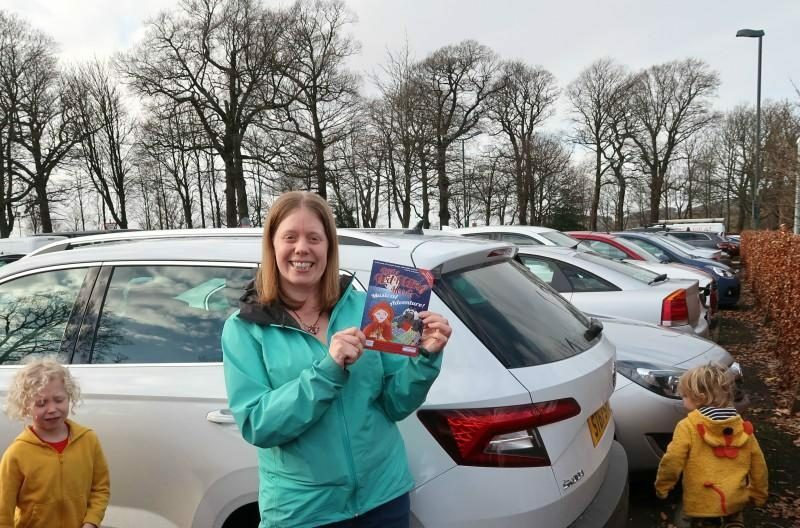 The car park was rather busy, but we still managed to find a space and used the Karoq’s parking sensors to help reverse it safely into a spot. On our final day (after a long lie-in for me due to a late night with friends!) we had a mini adventure to Flanders Moss. 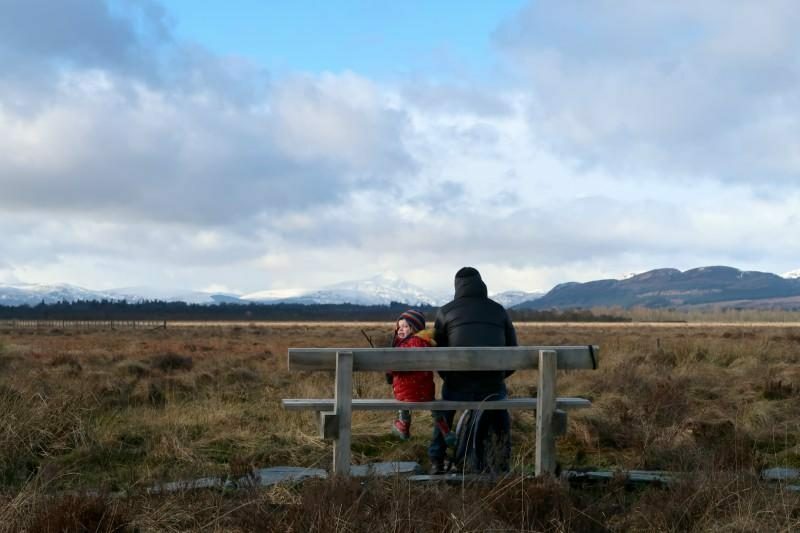 Flanders Moss is a small are of remaining bog on the carse of Stirling and is a nature reserve complete with a board walk and viewing tower. Of course the kids had great time and the Karoq, yet again, coped with the pot holed roads particularly well. 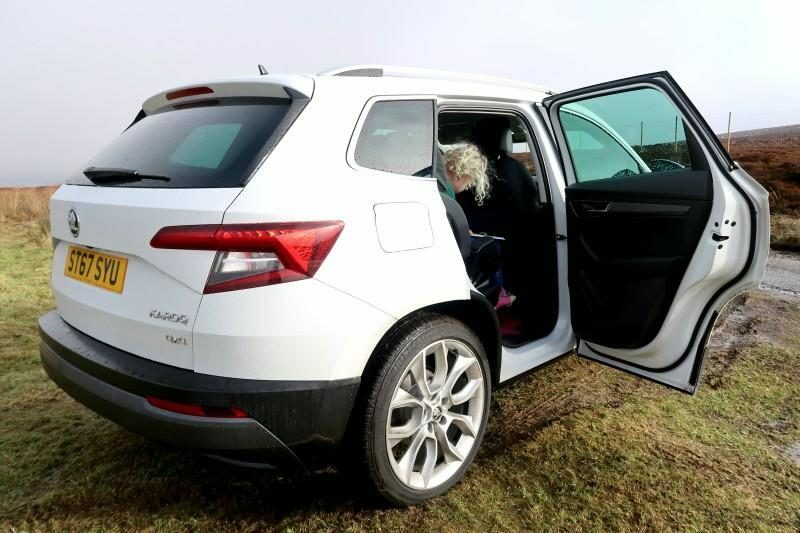 When we finally returned the car on Sunday afternoon we were all exhausted and rather sad to say goodbye to the SKODA Karoq. The kids and us loved having it for the weekend and would happily have swapped it for our current car! 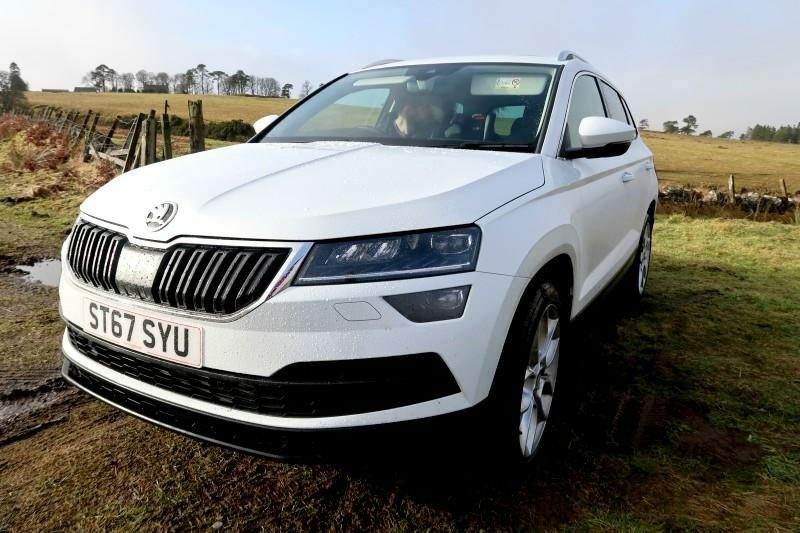 There are a variety of different SKODA models and this SKODA SUV definitely has the thumbs up from us for it’s family friendly features and gadgets. We will definitely be considering a SKODA for our second car and this new SKODA 4×4 will be serious contender. 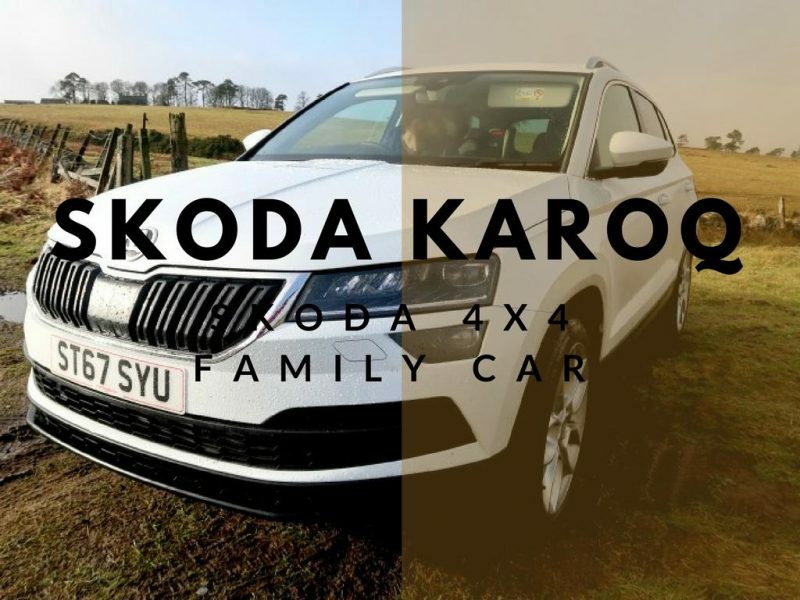 You can find out more about the SKODA Karoq here. * This is a sponsored post with John Clark Motor Group. Wow, I love this! The sunroof is awesome. Great that it was comfortable on the bumpy roads too. We will be in the market for another car soon, we’d definitely consider this. It looks just the right size for us all. This looks really stylish and quite similar to our qashqai which I love. I’ve heard good things about Skoda too. It’s definitely stylish and we’ve never had many problems with SKODA. I’m picking up my new skoda koraq on friday ? I’m desperate to find a well fitted car seat for my five and a half year old? Can anyone help and advice? Eeek! Exciting! We used my son’s usual Graco seat and it was absolutely fine. It should fit most car seats.